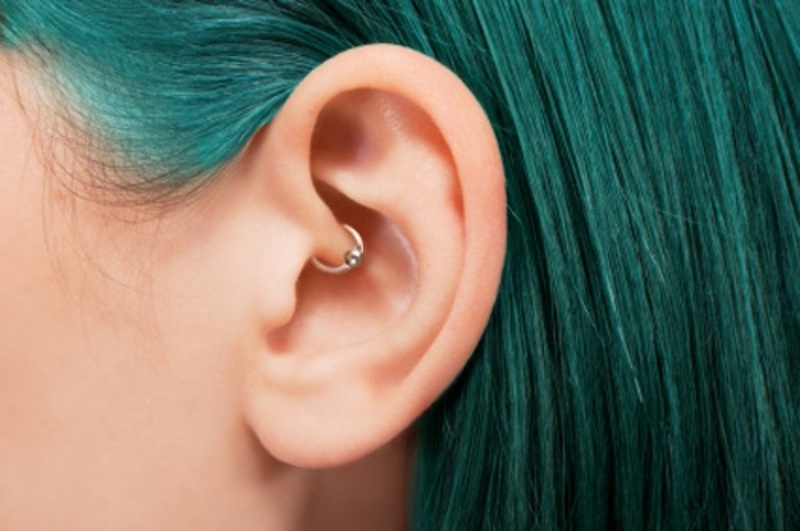 Known as a daith piercing, it is a small ring that pierces the inner cartilage of either ear, running through a pressure point. If you see this piercing around town realize that the wearer may be doing more than being trendy. This piercing is cited as being a cure or deterrent against migraines! While no substantial studies have been conducted as of yet, this idea is getting a lot of attention. It’s loosely based off acupuncture philosophies. By placing the metal hoop at the crux of the ear applies not only constant pressure but redirects blood flow. This redirection of blood flow and pressure causes a domino effect that keeps the pressure down in areas of the brain. With one in five Americans suffering from migraines, the need for a solution is clear. There are no consistent treatment methods for this very painful and debilitating chronic condition. The attitude seems to be: hope you don’t get one and if you do, develop a migraine, god bless. No wonder forward thinkers are dissatisfied. People have posted that they haven’t experienced any migraines since getting the piercing. Relief is ‘guaranteed’ to begin as soon as your skin is punctured. If you opt to try this, and why not if it helps it helps, explain to the piercing specialist your intention in getting this. Do they know where to pierce (the highest crux of the inner fold where ever the cartilage is thickest)? Is it a clean environment? A reputable shop? The coin is still in the air whether this is a great application of acupuncture or the power of mindfulness. As more people try this option, I expect a University to do some sort of credible study.